Contact the owner Ken @ 937-902-7979 or ken(at)turnerworld(dot)com.The ultimate FAMILY Boat. 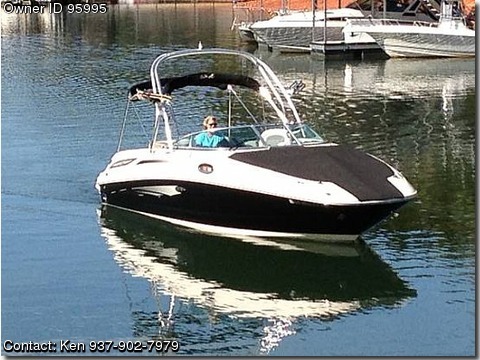 This 2010 Sea Ray Sundeck is extremely clean, low hours with all the extra's including the optional 496 MAG Bravo 3 engine 380Hhp, Wakeboard Tower, Full Bimini, bow and cockpit snap down covers, wet bar sink and storage for the cooler with built in trash receptacle. Awesome sound system with MP3, iPod connections and cradle with charger. A pump out head and sink in the head area. 2 in the floor storage areas big enough for all your boards, toys, and ropes. Table and boarding ladders off the bow and transom. This boat has it all This boat strikes a perfect balance between function, style, and innovation with its abundant seating, sporty good looks, and tons of storage. Options Wake Tower Captains Exhaust Selectable Smart Tow Upgraded Stereo Custom Winter Mooring Cover Custom matching TRAILER with wheels and full-size spare LOW HOURS 25… Always Freshwater and stored undercover on Trailer.